Author Ann Leckie came to Lindenwood to field questions and talk about writing. 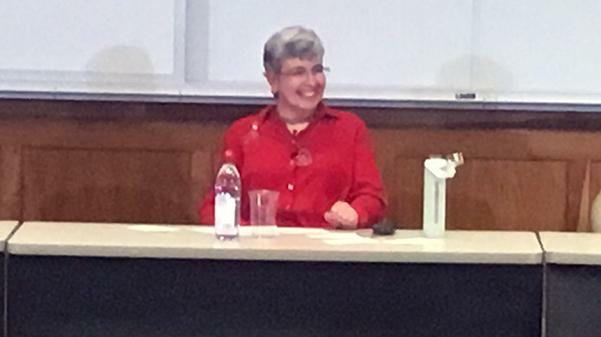 Lindenwood played host to author Ann Leckie on Wednesday, April 25, in the Dunseth Auditorium. Many aspiring authors were in attendance to ask questions about her novels and how to craft stories. Science fiction and fantasy are Leckie’s genres of choice. She said she has been a science-fiction fan since she was little. The “Imperial Radch” series is unique in that it uses female pronouns for everybody in the series, even for those later revealed to be male. “I was trying to hold on to the idea that what if our standards of beauty were not biological standards of beauty, but a question of what cultural assumptions are of who’s in power,” Leckie said. “Ancillary Justice” was the subject of controversy for the “Sad Puppies,” a voting campaign some authors started in an attempt to nominate works they found more deserving of the awards. They believed the awards were slanted in favor of novels with more progressive themes. Leckie stayed quiet throughout the controversy and said there were a couple reasons for this. Leckie stressed that research is very important in science fiction. She said people should make a choice about whether they want to pay attention to physics, but it shouldn’t bog people down and hinder their writing. Leckie said she sometimes takes fans’ comments about her work into account, but other times, she disregards them. “Ancillary Sword” was one book where she listened to some fans’ comments about how to improve her work. “There are some things in ‘Ancillary Sword’ that are explicitly said on the page, because I had seen some conversations in other places, and I thought, ‘First of all, that’s a thing that I was only half thinking about, and secondly, there are people who really need to have this thing on the page,’” she said. Although it can take authors a long time to get their works published, Leckie encouraged them not to give up. Leckie’s next novel. “The Raven Tower,” is set to release in early 2019.